Natural interaction refers to people interacting with technology as they are used to interact with the real world in everyday life, through gestures, expressions, movements, etc., and discovering the world by looking around and manipulating physical objects . In the domain of cultural heritage research has been conducted in a number of directions including (a) Personalised Information in Museums, (b) Interactive Exhibits, (c) Interactive Games Installations in Museums, (d) Museum Mobile Applications, (e) Museums presence on the Web and (f) Museum Social Applications. Most museums target family groups and organize family-oriented events in their programs but how families choose to visit particular museums in response to their leisure needs has rarely been highlighted. This work exploits the possibility of extending the usage of AmI technology, and thus the user experience, within leisure spaces provided by museums such as cafeterias. The Museum Coffee Table is an augmented physical surface where physical objects can be used for accessing information about artists and their creations. At the same entertainment for children is facilitated through the integration of popular games on the surface. As a result, the entire family can seat around the table, drink coffee and complete their visit to the museum acquiring additional knowledge and playing games. 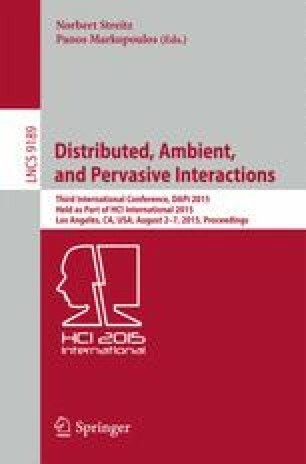 This work is supported by the FORTH-ICS internal RTD Programme ‘Ambient Intelligence and Smart Environments’ [1, 15, 29].